Let’s be absolutely clear about this, data protection and privacy is super important to us. This page has some legal technicalities, but also is underpinned by a genuine concern that we do everything we can to ensure your data is treated with the respect that we would want our data treated. We have reviewed our data collection and retention policy in line with the General Data Protection Regulation (GDPR). This page provides an overview, if you would like more details please contact our Managing Director, Nicola Payne (nic@noisylittlemonkey.com). If you are a customer or supplier, we will have your data stored in a number of other places for the purposes of invoicing, paying bills and delivering projects. This page relates specifically to the marketing data collected via this website or our marketing events, please contact Nicola if you need other information. We collect personal data from visitors to this website through the use of online forms, email hyperlinks and the contact us page. We collect your details when you email us with an enquiry. We may also have collected your details when we met you at an event or you came to one of our training sessions. More generally, we do not pass on our data to any third party. If you have attended a workshop, downloaded a content offer or asked to subscribe to our newsletter then we collect your name and email address and use this to send out news and information from Noisy Little Monkey. You can unsubscribe from the mailing list at any time, either by using the unsubscribe feature on the newsletter or by emailing claire@noisylittlemonkey.com. We collect personal data so that we can contact you if you give us consent to do so. Specifically we collect your name, email address, company name and website URL, a phone number and description of your role. If you become a customer, we will ask you for more detailed information, including your favourite biscuit. Hubspot is our client relationship management tool and collects and stores your data. In this instance, Hubspot is the data processor and Noisy Little Monkey is the data controller. Hubspot is a cloud based provider with a significant European customer base and impressive commitment to GDPR. It is registered with the EU-US Privacy Shield Framework. More about the Hubspot commitment to data protection. Objection: You have the right to object to our processing of any personal data about you which is based on our legitimate interests (or those of a third party) based on your particular circumstances. You also have the right to object to our processing your personal data for direct marketing purposes. You have the right to see the data we have collected about you. If you have any requests concerning your personal information or any queries with regard to these practices please contact Nicola. If you’d like to opt-out of receiving email or newsletter communications from us, or would like to change the media that we use to contact you (like changing from email to postal mail), please contact Claire or call us on 0117 327 0171. Our newsletter always includes an unsubscribe button. From May 2018, our policy is to retain personal information related to our marketing for two years, If we have not substantive contact with you over a two year period then we will delete your record from our database. If you become a client - whether or not we market to you - we will maintain your information and that of your employer so that we can do business together. When we no longer work together we will retain your personal information for no longer than is necessary. There is a legal requirement for us to keep accounting dat that relates to your business for a minimum of 6 years. We keep project documentation for a minimum of 4 years unless you request otherwise. If you would like to see or remove your personal data from our database, again please get in contact with claire@noisylittlemonkey.com. 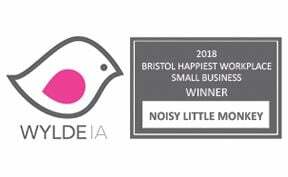 We are both based at the Noisy Little Monkey office: Loft 5 Tobacco Factory, Raleigh Road, Bristol BS3 1TF. In addition to the above, we collect anonymous data information automatically about your visit to our website through cookies. Please see our Cookies Policy for more details. This does not fall within the remit of GDPR but is important.